Edie and Andy: "Whatever, I'm fabulous! I love being me!" Sadly I am embarrassingly behind on blogging - but with very good reason! I have had a steady flow of visiting friends, including Lexie and Kathryn, and Devin Mills! I've had such a good/busy last week that it's been impossible to keep up with all of the cool things I've done and all the delicious places I've eaten. Last Saturday was one of those days that's a little too perfect. 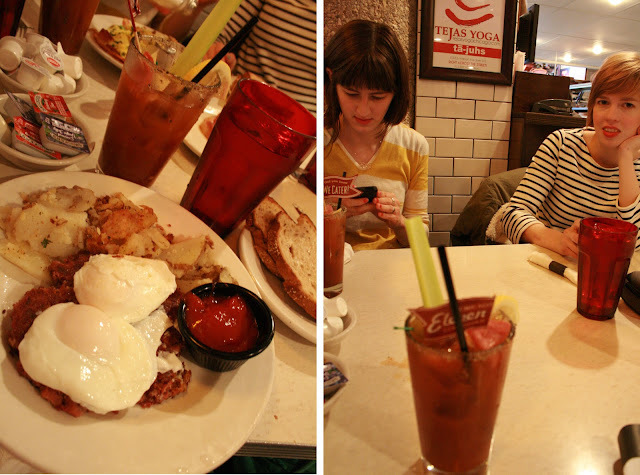 Woke up early, blogged, went to Eleven City Diner for breakfast and bloody marys. Rode the train to Wicker Park for some shopping at Reckless Records where I found a copy of the soundtrack for Storytelling by Belle and Sebastian on vinyl! We stopped by Buffalo Exchange where I found two pairs of shoes, and we also visited the boots I have been lusting after at John Fluevog. We then went to Vintage Heaven where I scored a really great ring and a wonderful vintage bucket bag from Mexico. Didn't you hear? Bucket bags are going to be all the rage this spring and summer!! After all that shopping, we'd only sort of worked up enough of an appetite to go to Hot Doug's, where we spent two hours waiting in line for our dogs and duck fat fries. I know, waiting in line for two hours in the cold without hats, gloves, or socks sounds pretty miserable, but we kept it real catching up on gossip and life talk. The two hours actually seemed to fly by. 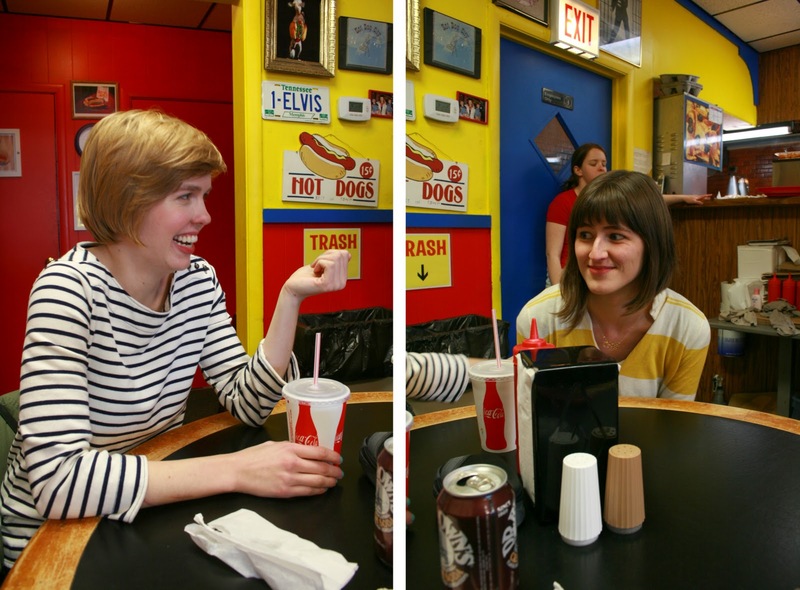 And we left Hot Doug's completely stuffed and satisfied. We went to two Zara's to find a dress for Lexie, and then off to the Gap where I found a darling nightgown and became obsessed with the idea of wearing a wireless bra (Note: This is life-changing). Then after all this, we went back home for dark n' stormies, applied makeup and lipstick, and headed out to two birthday parties in Logan Square and Uki Village, only to return home at 2 in the morning. All in all, it was a PERFECT DAY. Thanks Lexie and Kathryn!!! Duck fat fries, cheese sauce, Chicago Style dog, corn dog, and plenty of soda! Sounds like a delicious and fun weekend. ooooooo wireless bras! the best! you are the BEST hostess ever, sandy. i had so much fun.